2014 is an even-numbered year. Only a few more hours, a tick of a clock, and we’ll be in 2015, an odd-numbered year. Which do you prefer, the odd or even numbers? Which years bring you more happiness, or more pain? Do you emerge from those painful years like a phoenix flying from its ashes? I like even-numbered years. They seem more rounded, less pointy. Four is more rounded than fourteen, i.e., ’t’ in teen is spiky, the 'ee' brash. Five is less desirous than four, harder to say, to read. Fifteen is definitely on the corrupt side. 2020 is a good round number. Only the 't’s' are a bit spiky. The rest just rolls off your tongue like sweet juice. Tomorrow, 2020 will be closer than we've ever seen it. We're half way through the teens, going into the twenties. My, how time flies. That doesn't mean odd-numbered years are bad. 2013 that had lots of spikes, and is far too brash, was a pretty good year. My husband and I built a house in 2013, which could be a nightmare, but it wasn't. Our builder was really professional. He gave us no hassles, and now he and his wife are good friends. Despite odd or even-numbered years, life’s road leads us through the landscape of different experiences. My husband wouldn’t say he liked even-numbered years. For years, the Universe kept telling him to move out of his status quo existence, but he wouldn’t listen. In 2008, he lost several friends through illness and accidents. In September, Hurricane Ike pushed his house off the foundations, and the world called it a total loss. Two months later, we were married. A true up and down year. By 2009, his whole life had changed, and he was much happier for it. I believe throughout our lives, we go through issues that make us better, help us to gain a higher spiritual level. Sometimes, we are supposed to make changes in our lives, but we are afraid, or we stall, thinking we’ll be fine if we don’t upset the applecart. An odd year, 2005, which as I said I’m not too fond of, did that for me. No discreet knocking on my door worked to make changes. Apparently, everything I knew had to be broken before I saw the light. Almost out of the gate into the new year, I noticed trickles of water running down the wall of my carport. I called a roofer, where not only did the roof leak, but the electrical gizmo that sends electricity into the house was pulling away from the structure. I needed an electrician and a roofer. The kitchen sink kept stopping up and the plumber said the sewer hadn’t been installed properly when the house was built. The entire sewer line under the house had to be replaced. At the same time, the car started leaking transmission fluid. I needed a new car. Then, I went to the doctor for a routine checkup and she said a lump in my breast was 99% cancer. January 2005 had been an eventful month. My oncologist said, ‘Give me a full year, and then I’ll set you free, healthy and whole.’ With those words, I relinquished my care into her capable hands. This opened up a whole new world for me, gave me freedom to find out who I was. I took off work during the process, sat outside with a cup of tea and listened to the birds in the trees. I focused on the beauty that was all around me. 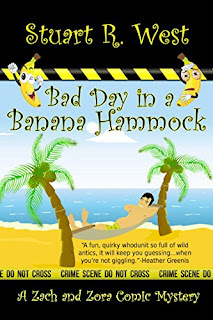 I appreciated the differences in the human psyche, their own trek through life, how they responded to bumps in the road, and I bought a puppy. They say it’s not what you go through but how you come out of the experience that makes the difference. If you are a better person for it, then your journey was good. The odd numbered year of 2005 was a good one for me, one of the best years of my life. Let’s drink to 2015. May this year bring you happiness and good cheer. May your experiences, good or bad, bring you joy. Food is a topic that, for me, needs little excuse. Not simply preparing and consuming food, but the occasions that have food at their center. And there is no better time to discuss the sharing of good food with family and friends than at holiday time. While attempting to organize my computer this past week, I happened on a slew of videos. 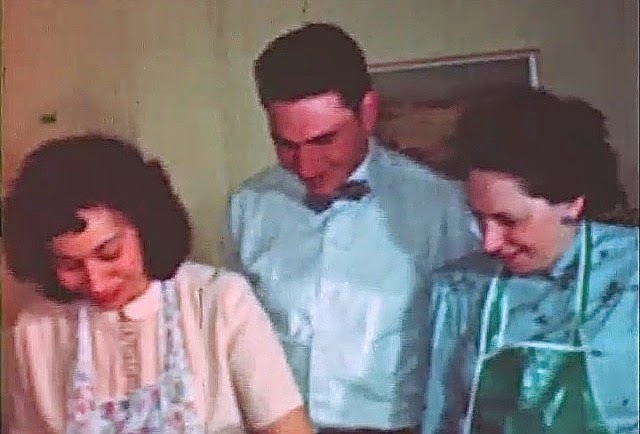 Actually they are converted home movies from my late father’s collection of 8 mm film from the late 1930s when my parents started dating to the 1980s when video supplanted celluloid for recording memories. It was a trip down Memory Lane in many ways, filled with a few tears and laughs, and also a time to appreciate where my love of cooking and baking came from. There were my grandparents looking young, slim and hardly gray-haired. 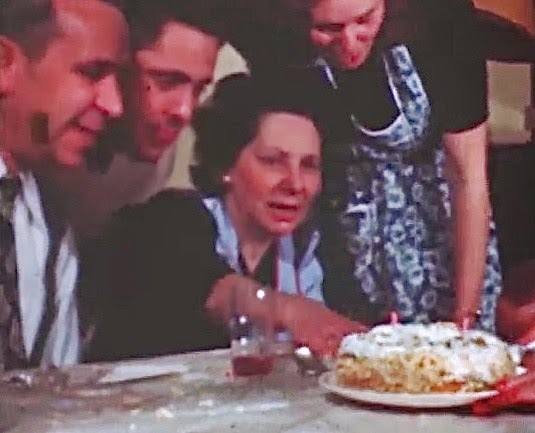 I quickly did the math and realized I was watching images that were 70 years old or more, which meant that my grandparents were a good 25 years younger than I am today. Back in those days my parents, a few lifelong friends, along with cousins, aunts and uncles all converged on my grandparents’ large Bronx apartment. Invariably, there were scenes of overflowing tables, smiling faces, the special cake…and the women all in full aprons. My gram was renowned as a good cook. Her brisket was legendary. It was always a treat to arrive at their place greeted by the warm aroma of chicken soup and even warmer feelings of having the family assemble for an event of sorts. My mom and aunt would always lend a hand and we kids would amuse ourselves until time came to dig in at the table. Over the years, after my family moved from The Bronx to Long Island, our house or the cousins’ alternated at being the epicenter of our culinary gatherings. My mom was a great cook, often replicating in her own kitchen what she’d learned from her mother. She didn’t “experiment” much back then, but after we moved to Connecticut, her talent for throwing sumptuous dinner parties took hold. My sisters and I would help out in the spacious kitchen, mostly chopping this or peeling that, but as we were then in our teens and tweens, food preparation was not at the top of our priority list. By the time my parents retired to Florida, my mother’s skills had blossomed into the awesome category. Long before that, when I was a new bride and my husband and I moved away for a while to teach at a college in Indiana, I often asked my mom how she made certain dishes. She sent me recipes, some in her impeccable script, others typed on office memo sheets, which I still have tucked away into my first and still favorite cookbook. Over the years, as distance separated me from sisters and cousins, and the older generation passed on, cooking became a passion, a way to maintain a hold on the past and a link between those of us who remain. We no longer spend our holidays, birthdays, and other celebratory occasions in those large joyful gatherings of my childhood. We have scattered over distances that make such get-togethers impossible. My two kids are grown, and there’s a grandson, and my sisters have their own families. But when we do get together for whatever reason, the highlight of the visit invariably involves the preparation of an incredible meal, riffing on an old favorite or discovering something new. The only things missing are those cool aprons. It is nearing the end of December and the New Year is shoving itself to the forefront of everyone's mind. All the Christmas goodies have been consumed or given away in festive holiday containers to family and friends. Leaving many of us looking at the calendar and wondering which day to begin storing away our exuberant display Christmas decorations; or deciding which holiday cards to keep or recycle. I, however, I am spending my morning staring out my office window at a profusion of lovely southern California greenery, listening to "The Martini Station" on Slacker Radio and slipping a cup of warm water (flavored with a bit of lemon) and tormenting myself with my Digital Fitness Monitor. The same Digital Fitness Monitor I purchase with my birthday gift cards (I am a June baby). That said, I'm back on my PC, where, after rotating though an endless round of 'personal' questions on the set-up and download screen, I'm ready to begin. Unfortunately my device needs to have the battery charged for two hours. You guessed it, I'm back on the floor yanking out the usb sync device and replacing it with the tiny (black) charger while trying to decide which end of the burgundy fitness monitor to shove into the charging unit. While I am waiting, reach for my iPhone and log on to MyFitnessPal with it's scanner and pre-programmed/personalized selection of my fave, and often selected foods, over the past three years. Even though it's time for a change (I did join an upgraded gym six months ago), and those same twenty pounds have come and gone. . .and returned numerous times over the past five years. Change is always a challenge. Is this a challenge I'll like? I very much doubt it--I love my coffee (Starbucks: Gingerbread Latte, hold the whip) way too much. Will I give my new digital fitness monitor the old college try? Yes. After all what choice do I have (the darn thing was expensive!). I'll grumble, I'll complain, but I will use the digital device. After all, "Ask Dr. K", newspaper columnist and physician and professor at Harvard Medical School, says that most people use the devices and adopt a healthier lifestyle. He also has the results of surveys and studies to backup his findings. I can't argue with proven success. However, I draw the like at wearing the device while I sleep--I don't care if a wrist band, complete with Velcro fastening--and you guess it--in a nice shiny shade of black, came in the package! 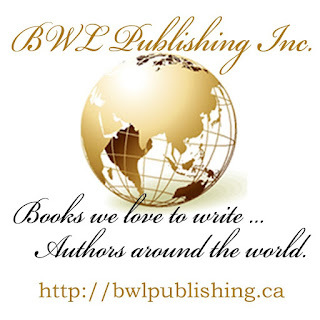 Wishing you a New Year filled with joy and many blessing, as well as an E-Reader filled with wonderful stories from Books We Love Authors. Having lived or vacationed in nearly every state in the continental United States, I feel secure when I say southern California is the place for romance. From wine country to the mountains, from sea shores to the Hollywood Bowl, California's backyard is tailored for romance. Be it a romantic evening with your special someone, or the perfect setting for a romantic novel, southern California is the perfect place. Malibu. The drive along the coast is breathtaking, romantic restaurants overlooking the ocean pepper this beach city. Geoffrey's Malibu and Nobu Malibu are the most popular. The Hollywood Bowl. There are many places to see live music in Los Angeles, but the Hollywood Bowl is a wonderful experience. It's romantic and spectacular. You can purchase a picnic meal with wine at a local restaurant and dine at the Bowl. From the LA Philharmonic to musical productions, there's something for every couple at the venue. Beverly Hills. II Cielo Was named one of the top 100 most romantic restaurants in America by open table, an online restaurant reservation network. Despite being in the middle of the city, the restaurant managers to close itself off from the chaos. There's an ambiance – – a romantic vibe. Laguna Beach. For me it's a cross between La Jolla and Newport Beach. There are steep cliffs and a quaint beach town. The restaurants, my favorite being "The Cliffs", are perched on the edge. Seafood is fresh and expertly prepared. Hollywood movies were filmed here: "Beaches" and "The Creature from the Black Lagoon" to name a few. Santa Barbara. For those who want to get out of town, Santa Barbara is a couple hours drive from Los Angeles. "Cold Spring Tavern is the most romantic place, especially if you write historical fiction. It's actually where the trains came through for the gold mine. It's a romantic dive. It's a log cabin, and you can jeans! Though not in SoCal, San Francisco must be included on my list! The Golden Gate Bridge, Cable Cars, Painted ladies, Fishermen wharf, China Town, and the bay. When my husband and I visit San Francisco, "The Franciscan Crab Restaurant" is our preferred dining experience. Pier 43 1/2 Fisherman's Wharf, the view includes Alcatraz, Gold Gate Bridge, and the bay. If you are unable to visit southern California, you can always experience the SoCal vibe. Catch a movie-- be it campy or romantic (Christmas in Palm Springs or Clueless), listen to sound of ocean waves or the tunes of "The Beach Boys". Relax with your honey, and sip a glass of wine or indulge in a latte or two. Remember southern California is a state of mind--and romance is everywhere around you. I hope you enjoyed your Christmas, or Celebration of your Faith. As I researched my medieval series, The Curse of the Lost Isle, I was reminded of old holiday traditions, and discovered a few had surprising origins. Whether we celebrate Christmas, Hanukkah, Kwanza, the Saturnalia, the new year, or any other holiday tradition, we usually believe the origins are specific to a religion or simply marking the passage of time. Not so. Our traditions are an amalgam of many Druid, Pagan, Norse, Celtic, Greek, Roman and other old traditions, passed on and adapted to the changing beliefs of the time. Historically, fifteen thousand years ago, well before Christianity, our ancestors celebrated the winter solstice shortly after December 21st. Not just in Europe, but all over the northern hemisphere. When they noticed the darkness receding as the days grew longer, they celebrated their hope for the return of long, sunny days. That was enough to rejoice, although many superstitions and traditions were added to the celebrations. Archeological digs near Stonehenge revealed a multitude of animal bones believed to be the remnants of sacrifices to the gods, and extensive feasting involving gatherings of thousands of people for the winter solstice. The rise of Christianity proved laborious, often imposed at the point of a sword. Many older cultures already entrenched in their own customs, refused to abandon their cherished traditions in the name of the new religion. 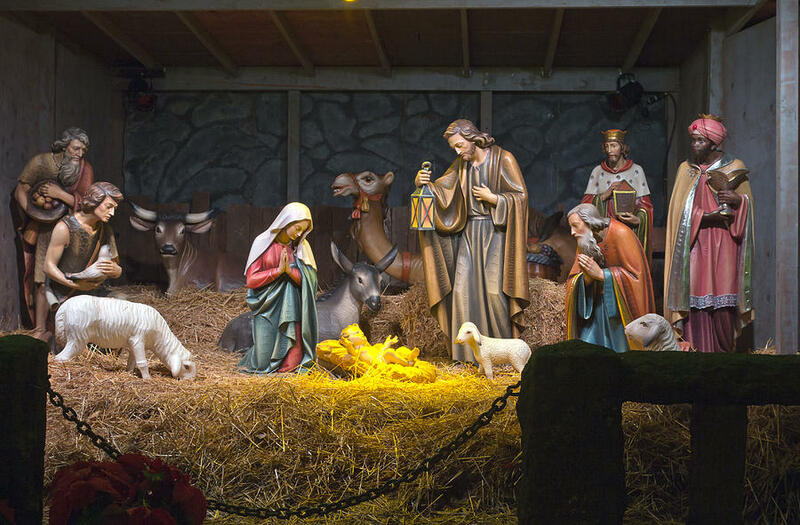 Unable to prevent the newly converted Christians from celebrating their old Pagan holidays, the Church leaders in the fourth century instituted a new holiday to celebrate the birth of Jesus (the existence of whom many Christians tended to refute) on December 25th, so it would stand at the heart of the formerly Pagan celebrations. Thus, the old traditions remained, in the name of a different god. Scholars have long ago determined that according to the seasonal details in the scriptures, Christ would have been born during the spring, when the flocks of sheep pastured in the hills. Besides, according to the astrologers of the time, Jesus brought forth the age of the Pisces (the fish is still a strong Christian symbol), and according to the Zodiac, would have been a Pisces himself, consequently born in March. Other customs, like decorating houses with lights and hitting the shopping malls, are quite recent. 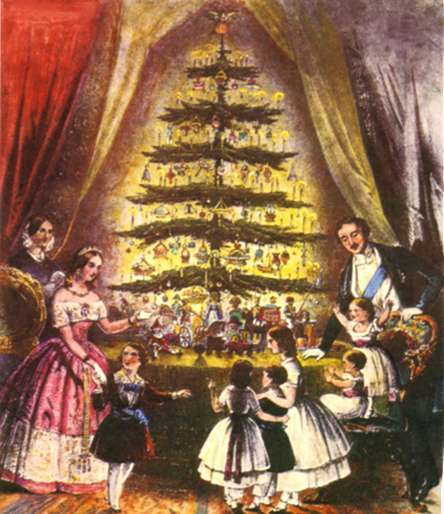 Queen Victoria started the trend of gift giving at Christmas, and in the Twentieth Century it gave birth to an entire industry. She also promoted the Christmas tree. As for the Christmas tree, Norse and other Pagan cultures used to cut boughs of evergreen in winter and move them into the home or temple, then decorated them. Modern-day Pagans still do. An English monk who'd traveled to Germany, brought the tradition to England in the Seventeenth Century. When I was a child in France, the local priest forbade his parishioners to have a decorated tree, as it was considered a heathen tradition. Only a Nativity scene graced our home at Christmas time. 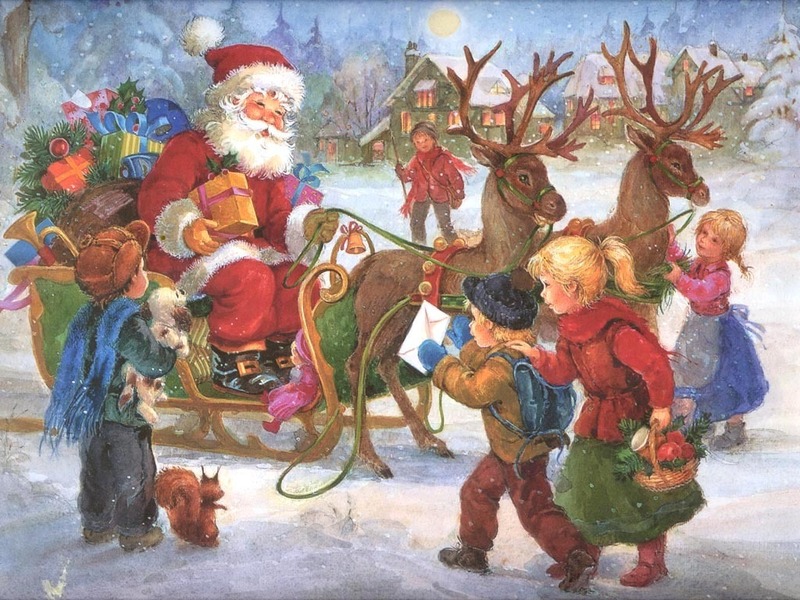 In my father's family in Western France, Santa Claus or Pere Noel (Father Christmas) was also forbidden to good Catholics well into the 1960s. The myth of Father Christmas dashing through the sky in his sleigh derives from old Pagan spirits flying through the sky at mid winter. My cousins were told that Jesus himself came through the chimney at night to bring presents to well behaved children. Even the good St. Nicholas (who eventually became Santa Claus) was shunned by the Church for centuries for its Pagan overtones. The early Puritans of the East coast also banned the Christmas celebrations for centuries because of their Pagan roots... and the heavy drinking and excesses usually accompanying the festivities. Kissing under the lucky sprig of mistletoe is a Greek Saturnalia tradition. 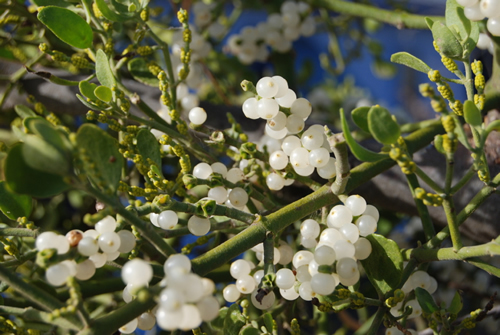 Mistletoe was sacred to the Greeks and the Celts as well as the Druids. 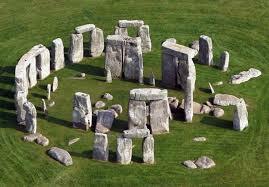 It also had magical powers, and was the center of many fertility rituals. But it didn't correspond with the New Year at the time. 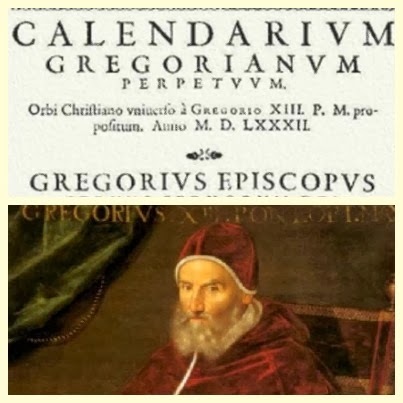 The New year started on March 25, until Pope Gregory XIII instituted the new calendar in 1582. If you look closely at our modern calendar, the names of the months are all wrong. While the first months wear the names of Roman gods and emperors, September (according to the Latin roots) means the seventh month, October the eighth month, November the ninth month, and December the tenth month. This is because as Pope Gregory changed the date of the new year and promoted January to the first month of the year, the names of the calendar months remained the same. This said, I believe the holidays should be a time of rejoicing, celebrating all the traditions of Earth's many rich cultures. After all, with the explosion of cyber-media, we will soon be one people embracing all traditions, coming together with love and forgiveness at year's end, each making resolutions of becoming a better person for the benefit of all. I wish you the best of holidays this year, and lots of happiness in the New Year. It is Christmas morning as I finish writing this, but by the time you read it Christmas Day will have been and gone. I hope you all had a wonderful time with your loved ones. Here in Australia it is a warm day and the forecast is mid 20s, just right, not too hot and certainly not cold. I don’t know if it’s something to do with growing older but one can’t help reminiscing about Christmas’s past at this time of the year. There will always be some that stand out of course. Because I was the youngest in a large family most of my Christmas’s as a child were memorable, but one stands out from the rest. I can still relive that feeling of wonder when I awoke while it was still dark. In London that was more than likely about 6am but I guess I imagined it was still the middle of the night. The wonder was that once again Santa had been and I had slept right through his visit. I was probably about six. My sisters were still snoring alongside me. I peeped over and there by my bed was a cot for my new doll. There were various other small gifts but the cot was the stand out. This wasn’t one of those fancy ones the kids of today would receive, but a simple wooden frame with fabric stretched across it (a miniature bed really). I found out much later that one of my brothers made it. Most of my toys were made by a brother or sister or my mother. The doll lying on it was one of those old fashioned types with a rag body and a china head. I also realized a long time later that my mother made these. The head would be bought and she would fashion the body and stuff it. The heads of these dolls had hair painted on them. Some girls would be lucky enough to receive a doll with fake hair, and my dream was to own a doll with long hair that I could actually comb. The nearest I got to this was a rag doll about 12 inches high that my two older sisters made. She had hair of cotton and the beauty of this was that it could be trimmed, or even cut really short, then when the mood took me I would simply wind yellow cotton (always yellow as my doll had to be golden haired) around a book until I had the right thickness then these strands could be sewn onto her head. I had that old rag doll for quite some time, and her hairstyle changed numerous times. But back to Boxing Day. As much as I loved Christmas Day itself there was always something special about the day after. This was leftovers day. As I grew and all my older siblings married and left home to go their separate ways it was tradition that they come to eat the leftovers on Boxing Day. After a large lunch the men would doze while the womenfolk cleared away the mess left behind. Come evening there would be another party. We would gather around Aunt Flo’s old piano while she banged out a tune. Each member of my family had a song they called their own. My favorite was and will always be my mother’s. It went: "You wish me to forget you, you say 'tis best we part; When all my life I've loved you in return you break my heart ...” I can still hear her clear voice. No great singer; but she knew every word of this beautiful ballad, and touched our hearts with her rendition. The tradition remains in our family—Boxing Day is still special. Most of my family have passed on sadly, but I will always have memories to treasure and hope you are making wonderful memories at this special time of the year. I wish you a Wonderful New Year and as we all do wish for peace in our world.